Back in stock! 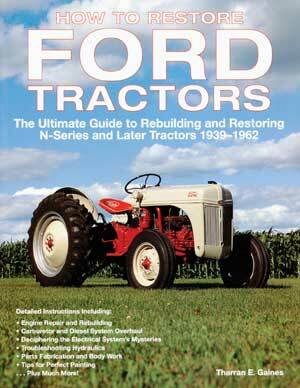 How to Restore Ford Tractors: The Ultimate Guide to Rebuilding and Restoring N-Series and Later Tractors 1939-1962 does an excellent job of hashing out the details of restoring a vintage Ford tractor. Published in 2008 with over 200 pages, this soft cover edition includes wonderful pictures of unusual models and options scattered throughout the pages (as are many photos of hands-on, down and dirty restoration work being done). Though the book emphasizes the N-series machines, overhead valve Hundred Series machines are covered as well. Dealing with the engines, bad brakes, electrical systems, rusted body parts, paint and hydraulics are just a few of the topics covered. There is also a wonderful appendix for parts sourcing that tractor restoration enthusiasts will certainly appreciate. The N-News carried this book for years, but 4-5 years ago, Motorbooks said it was out of stock and they were not going to reprint it. Then we were informed that the book was available again as a short run and we sold out. Now it is back again in a reprint edition (not quite as nice as the original) but we are happy to have it again. If you don’t have this one on your shelf, don’t wait to order as this is another short run. Get it now for $29.95 plus shipping and handling. Well worth it!